As the saying goes, times they are a'changing, and regardless of what business you're in, you've likely felt that shift in someway over the past few years. With changing technology and shifts in the economy, many female entrepreneurs (and working women in general) have found themselves either learning to adapt, or struggling to stay afloat. Public relations expert Leila Lewis has learned over her 11 years in the industry, but her firm Be Inspired has managed to stay strong. Lewis' success is a testament to the the strong businesswoman and boss lady she is — which seems even more impressive once you learn that in addition to juggling her multiple ventures (she's also now running lifestyle site Inspired By This) she's also set to have her fourth babe this fall. 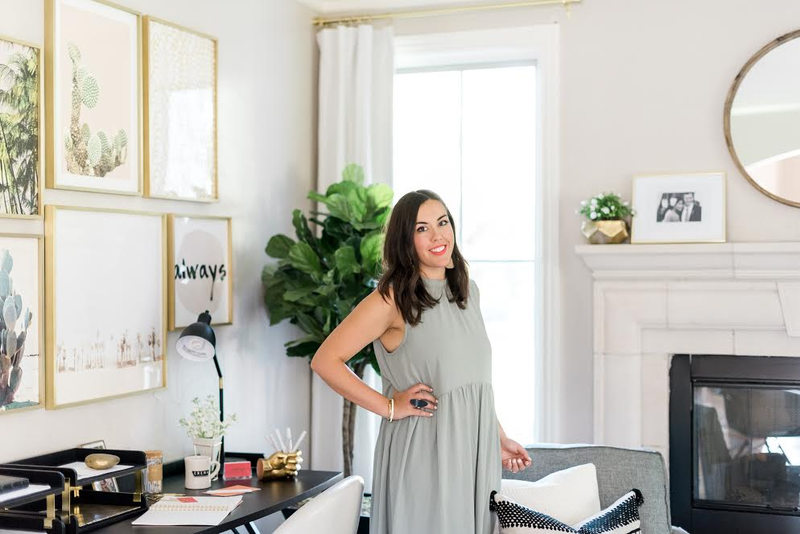 Considering the fact that she'll be working with her wedding, wellness, and lifestyle clients while taking care of four kids under the age of 6, we figured who better to offer business advice: from building your best team to (attempting) a work/life balance. Spoiler: it ain't easy but it's so rewarding. How did you first get started in public relations? Out of college I worked in the marketing department for a publishing company and got involved with their in-house events. After the company was sold off I made the decision not to stay on and instead pursue a career in the event space. While working for some of the top planners in the industry at the time, I started taking on the PR and marketing efforts for their businesses. I saw firsthand what PR can do to help grow a business and I decided to open my own firm in 2007. Fast forward 10 years, and now we're not only helping weddings brands, but we've expanded into the wellness and lifestyle industries as well. What were some of the challenges you overcame when you were first launching Be Inspired? At the start of my business, I was told "no" over and over — from wedding professionals who didn't understand the value of PR to wedding editors who had never worked with a publicist before. It took a lot of persistence and education to help both sides see the value. What were some of the most invaluable lessons you learned during that time? Treat others how you want to be treated! When you email someone and are warm it may inspire them to be kind right back. And if not, brush it off and be better than them. In PR, a pat on the back from your client or public recognition for your hard work may not happen as often as you'd like. Be prepared to define your own success and be fulfilled by what makes you happy — no one else is going to do it for you. What are your top tips for building a successful team? Find employees who thrive in being collaborative, create an environment that creates and supports teamwork and don't be afraid to let someone go if they aren't the right fit and trust the people you hire. We offer a one-on-one consulting program where I get to work with business owners. For me, that's one of the most rewarding parts of what I do because in working so closely with these clients I get to see their businesses grow and the excitement that comes with that. As a working mama, how do you define "work/life balance"? Non-existent! There is no perfect balance! You have to adjust your schedule and commitments each and every day. Some days require more mom time and some days require more work time. Very rarely is there a day where I'm doing 50% of each; it's all about staying flexible and making new priorities each day. What's your best advice for entrepreneurs who are creating a business in a burgeoning industry? Don't be afraid of change! I've seen the PR world evolve so much over the past 11 years. When I first started it was all about TV shows and magazines, and now so much of what we do is online and social media. I've seen established businesses close up shop because they refused to change and embrace a new way of doing things. If you want to build a successful business, learn how to not only embrace but also crave change! Follow Leila at @leilaklewis and Be Inspired PR at @beinspiredpr. Additional reporting by Danielle Directo-Meston.